A U.S. Army veterinary team joined with representatives of the Belize Agricultural Health Authority and Belize Public Health officials April 7-17 with the intent to boost the meat production of livestock, as well as the health of all animals in the Corozal region, Belize. BAHA veterinarian Dr. Joe Myers and Belizean public health inspector Karel Heredia traveled to the villages of Chunox, Progresso and Libertad to meet U.S. Army Capt. Brian Joseph, veterinarian and Sgt. David Arbiso and Spc. 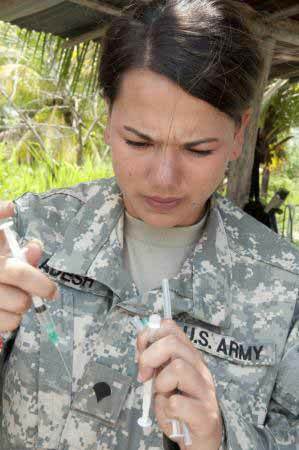 Megan Ladesh, both Army animal care specialists. The U.S. Army team is from the 149th Medical Detachment at Joint Base Lewis McChord, Wash. In each location, the Belizean and U.S. team went door to door vaccinating animals and administering vitamins to local livestock and pets as part of the New Horizons Belize 2014 veterinarian and medical readiness training exercises, also called VETRETES and MEDRETES, conducted by Belizean, Canadian and U.S. healthcare professionals. "Visiting the homes directly, we can see if there are any conditions that are of importance from a public and animal health standpoint," said Myers, who is also in charge of veterinary drug and animal feed administration at the national level. "We had also a one on one with a farmer and found out some of his needs and his thoughts on the whole event. "It's a win-win situation on their behalf. It's a service being provided free of cost, so to speak, and it's door-to-door," he added. From cattle, horses and pigs to goats, hunting hounds and pets, the team went through each village tending to animals' needs. "We're trying to increase meat production and increase the quality of life for the population. We do that by administering anti-parasitical drugs, and we do that for both the dogs and the livestock for different reasons - for the dogs for public health reasons and for the livestock to increase meat production," said Joseph, VETRETE officer in charge. Having the BAHA representatives on site with the U.S. veterinary providers was one aspect of the VETRETE that made the mission truly successful, meeting goals established prior to the exercise. While it's important the U.S. deployed to support the Belizean people, Myers said, it was even more important for Belizean officials to be present to show how cooperation and coordination between the two countries leads to greater care provided to people, as well as their animals. "I had been in communication long before [the exercise started]," Myers added. "I'm always willing and excited to cooperate." That excitement was reciprocated by Joseph and his team. "One of the best parts of these MEDRETE missions is the coordination with the host nation. ... Rather than us deciding what the mission is, we work back and forth and we ask, 'What are the animals in your local area? What are the demographics of the animals? What are your needs?'" said Joseph. "We work back and forth until we establish a plan, and then when we're in the field, we actually work with the local veterinarian. "We're all on the same team," Joseph added. "We worked amazing together," agreed Ladesh, a Reservist with four years of experience. "That was probably the best thing we had, as far as being their counterpart. They knew the people. They knew the animals. They knew the location." An added VETRETE goal for Joseph was to provide both animal care specialists a valuable training opportunity and experiences they can apply to future endeavors. Working with Joseph and Myers, the two received exactly that. Both Ladesh and Arbiso had worked mostly with military working dogs, and neither had extensive experience with livestock. "They're learning how you safely restrain pigs, how you safely restrain dogs in the field, how you safely restrain goats, how you work with the indigenous population, how you work with local authorities," Joseph explained. "Then, they're learning the technical things of how you give an injection to a pig, which is very much different into a dog." The result was increased knowledge, experience and confidence. "It's been a great, positive influence that we were out there together. Between Dr. Myers and Captain Joseph, the knowledge they have together was just mind blowing. They knew everything," Ladesh recalled. "[They're] very knowledgeable about every single animal we've touched, and Sergeant Arbiso has more experience, so his input was great. "If I continue to do these missions in the future, it will be great for me to be able to share my experiences with the livestock," said Ladesh. "I think the overall mission is great - to take care of the people and their animals. ... It was a great mission. I would do it again in a heartbeat."